The Meyer EZ Plus Mount plow is unique in that it mounts to the vehicle using an EZ Plus Universal Clevis. The same as its predecessor the MDII used the MDII Universal Clevis to attach the plow to the vehicle. The only major difference between the two (MDII / EZ Plus) is that with the MDII there was a set of yellow handle pins that could be disengaged to drop the plow and keep the pump and lights on the vehicle. The EZ Plus, the whole assembly comes off the vehicle with one set of blue handle pins. It is also MUCH easier to get on and off the truck versus the older MDII design. Because it is removed as a unit, there are no Couplers on the hoses. There is no reason to have them. Because it uses the Universal Clevis to attach to the truck, if you are buying used, try and get the Universal Clevis with the plow. You will see why later on this page. the same holds true if you plan on trading your truck in, and think you will just leave everything on the truck, BAD idea. "I need a headlight harness for my "Meyers" plow". "Which Harness do I need to order to install this used Meyers plow on my Ford?" "I need a GM headlight Harness for my Meyer e-60 plow." "I traded in my truck and took nothing off of it, what do I need?." You are buying a used plow, or you are interested in buying a used plow, you better do some research on what you are about to buy. You need to at least have a basic understanding, or in the end it is going to cost you A LOT more than you planned. Most people will think it is a lot to spend when it comes to plows. Often it is, and if you go in blind, you will be paying A LOT more. Just because you bought a used pow system for $500 from someone desperate to dump it does not mean the parts you need to make it work on your truck should be dirt cheap. You can hope, you can want, but that does not make it so. You may get lucky and find used, and someone that also just wants to dump the parts at a fraction of what they are worth. We all get lucky sometimes. So lets start with the most basic part, the EZ Plus plow that is for sale. You can't take a plow from a Ford and just bolt it right onto a GM, or a Dodge. There is a catch, the Universal Clevis that would be on that Ford, you NEED that part. So if the plow seller is offering the "mount" as well, TAKE IT. To attach the plow to the vehicle you will need two things, a Universal Clevis, and a Mounting Carton. The Mounting Carton is a set of brackets that attach the Universal Clevis to the truck frame. The Universal Clevis is sold separately, and is NOT included in ANY Meyer Mounting Carton. By now you can surmise that the Universal Clevis is universal, and you need it. Take it off your truck if you are trading it in! Mounting Cartons ARE vehicle specific. They will fit a brand of vehicle, and a specific span of years. In a nutshell, a manufacturer can change body styles, but as long as the truck chassis (frame) is not changed, the Mounting Carton will fit. For instance, 1999 Chevrolet/GMC 2500/3500HD used the same frame from 1999 - 2010. The body changed, the headlights changed, cosmetics changed, but not the frame. To contrast this long run, another example, the Chevrolet/GMC 1500 used the same frame from 1999 - 2006, then changed and ran from 2007 - 2013. So you buy the used EZ Plus plow, and it comes with a mount that does not fit your truck, fine. You need the Mounting Carton for your truck. Maybe you can find a used one, maybe you can trade the mount that came with your plow for it, or you might have to buy a new one. That will get the plow onto your truck. Next is the wiring. Once again, the wiring is universal except for one part, the Headlight Adapter. 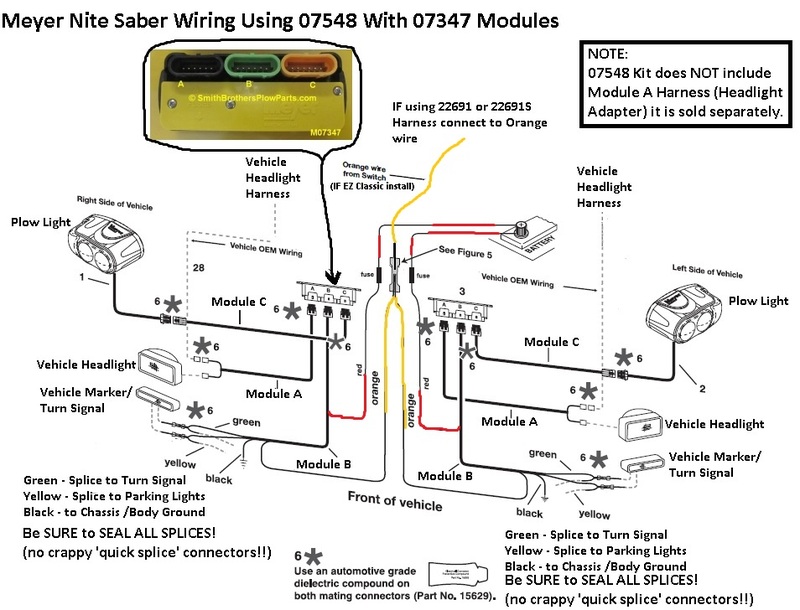 If you are buying that used plow, GET THE WIRING TOO! So the question I am asked so often above comes into play now, except it does not matter so much (until you get into 2011 & up trucks) what brand of truck it is, what matters (and even with brand new trucks) is what bulbs the headlights use. The Headlight Adapter mates to the existing vehicle headlight wiring. Every vehicle headlight, somewhere on the lens, along the bottom edge usually, is the bulb number, or bulb numbers. You will see "HB5" or maybe "HB3/HB4", or "H13". This is how you know what Headlight Adapter you need for your vehicle. For instance, the H13 bulb is used in some Fords, some Jeeps, and some Dodge, so it is not brand specific. New trucks are a nightmare in that on board computers control headlight circuits, and the fancier the vehicle headlights, the more expensive the Headlight Adapters will be. They must interface with the vehicle in a different way than older trucks that actually had fuses for the headlights. For example, a 1998 Dodge Ram, the Headlight Adapters are priced around $60. A 2016 (Dodge) Ram the Headlight Adapters have a 2016- 17 List Price of $299.00 and that is for HB3/H11 bulbs. IF that same truck has HIR2/HB3 bulbs the Headlight Adapter List Price is $199.00. To really scare you, a 2007 GMC Tahoe, the Headlight Adapter has a List Price of $345.52. The more expensive Headlight Adapters often include special Headlight Modules that are required for the lights to work properly. So aside from the Meyer EZ Plus mount plow, IF you got the mount and wiring along with it from the original vehicle, you will need a Mounting Carton (2016 - 17 List Price $465.17), and Headlight Adapter. IF you did not get the controller, you can add more to what you will be spending. Let's say you bought the EZ Plus mount plow, and that is all you got, a plow. Here is what you will need and the 2016 - 2017 List Prices for each part. Headlight Adapter - $60 - $345?? I hope you got a great deal on just the plow, because what you are missing is going to add up fast if you can't find used. I strongly recommend new (07548 at least) wiring. The last thing you want is a hacked up harness that was installed wrong the first time, with overheated and corroded wires that will give you gremlins down the road when you least expect it. You can see how you will be close to $2000 for what is missing when you include your State's sales tax. This also does not take into consideration paying someone to install the used Meyer EZ Plus plow if you can't do it yourself. This is why it is important to look for the most complete used plow SYSTEM that you can find, versus JUST a plow. More info on Meyer plows, mounts, pumps, lights, and wiring. If you want to know what parts from your old truck would fit your new truck, you can use the Transfer Tool on the Meyer web site: Transfer Tool it will give you a shopping list of part numbers you need. 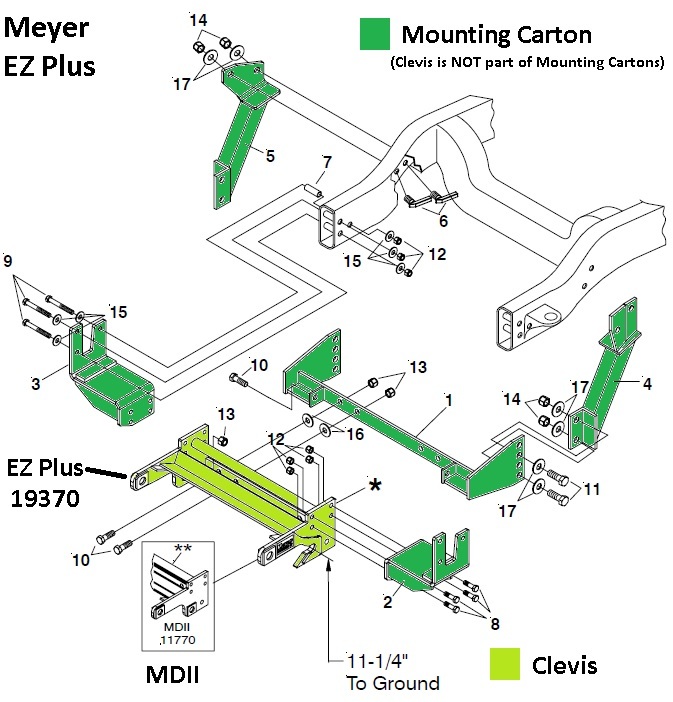 Meyer EZ Plus Mount Universal Clevis. This is NOT included in Mounting Cartons. Mounting Cartons are vehicle specific, this Universal Clevis is universal. It MUST mate to an EZ Plus Lift Frame. OEM Meyer Motor Solenoid part#15370. They do not need to be mounted on steel anymore. The White wire from the harness goes to the S terminal, and the I terminal must be grounded. Power Wire - Battery to Solenoid 36"
Lights Only Mode allows the Nite Saber plow lights to be turned on without activating the rest of the plow controls. Speed Select; double click a function button (up, down, left, right) and the plow will automatically perform... See Full Desc. This was originally designed for 2014 & up GM trucks with HIR2 headlights. It is now used with many vehicles from 2014 & up including Dodge. Ford has some that are Ford specific. It is referred to as a "Soft Start" Module in that it powers both sets (plow and truck) of lights for a couple of seconds and then switches over to one or the other.